Polamco Ltd. is an innovative, leading edge design and manufacturing company based in Bath. Polamco supplies connectors, backshells and a wide range of interconnect accessories that are used in a range of demanding and safety critical applications throughout the world. In addition to providing high quality standard products, the company has also developed a high level of expertise in creating custom solutions that are able to satisfy the most challenging of applications. An ever expanding array of products includes custom designed military connectors, a variety of shielded conduit systems, protective covers and specially designed interconnection components for cable harness manufacturing companies and OEMs worldwide. The company’s keen appreciation of its global customers’ needs is reflected in Polamco’s impressive in-house research and development program. Experienced company designers and engineers are able to respond to industries’ evolving needs, and through the use of first-class CAD/CAM facilities, ensure that the company stays ahead of its competition. The highly efficient nature of Polamco’s innovative design department means that it is able to provide product design drawings, to customers anywhere in the world, within hours of receiving an inquiry. The efficient manufacture of high quality components and assemblies, Polamco boasts a modern, highly computerised machine shop. Constant investment in the most up to date machine tools including advanced CNC multi-axis lathes and machining centres and the employment of skilled operators, has resulted in a well-organised, highly capable production facility. In addition to the stringent final inspection checks that are carried-out in Polamco’s dedicated quality control department, the company’s machine operators have responsibility for the quality of their own output. Nick Egan, Polamco Quality Engineer, explained “As we serve some of the world’s most demanding industrial sectors, including the Aerospace, Automotive, Defence, Communication, Oil & Gas, Ship Building, Medical and Mass Transit sectors, quality is central to all of our activities. In addition to administering an AS9100 Quality Process System, given the nature of our customer base we also hold an impressive collection of customer approvals. “Besides using sophisticated inspection equipment, including vision systems and an advanced Coordinate Measuring Machine, in our inspection department, we also provide our machine operators with the best available quality control aids to enable them to undertake their important in-process checks. “Internal grooves, such as circlip and oil seal groves, are amongst the most common features across our entire range. As the accurate measurement of the width and position of these grooves is one of our most difficult to perform gauging tasks and also critical to the quality of our products, we recently carried out a search for an improved means of groove width and position measurement. “Our new gauge criteria were extremely demanding, not only did we require accuracy measured in microns, it needed to be easy to operate and be robust enough to be used on the shop floor. 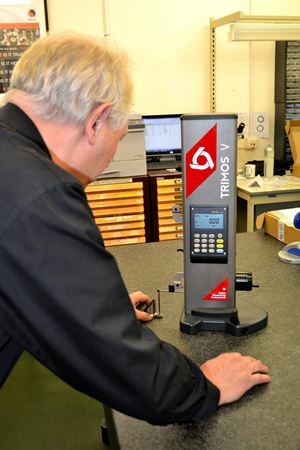 “Having had demonstrations of several alternative gauges and also loan periods that enabled more in-depth evaluation to take place, we purchased two Trimos V Series Height Gauges from Bowers UK. “As our loan Trimos Height Gauge was so easy to use, when issued to our shop floor operators, they were quickly able to use the gauge to make extremely accurate and repeatable measurements on components that had previously difficult-to-measure groove widths and positions. In addition, the V Series proved to be sturdy enough to withstand constant operation under shop floor conditions. “So successful have our first two Trimos Gauges proved, we plan to order another four models, with the possibility of even further purchases. Not only have the V Series further enhanced our already excellent measuring capability, they have considerably speeded-up a previously time consuming inspection task. Available in two application sizes, 300 mm and 600 mm, the robust yet precise Trimos V Series Height Gauges are ideal for use within the workshop environment. The easy-to-operate gauges provide users with outstanding accuracy, guaranteed repeatability and rapid performance. A rechargeable battery pack enables autonomous operation, negating the need for trailing power leads and air supply, whilst the gauges’ small foot print renders them perfect for operation alongside machine tools. A simple display unit allows quick performance of all required functions, including zero setting of the display or preset value setting, selection of mm or inch, step heights, ID / OD measurements, surface and centreline distance measurements and min/max/delta value. If required gathered data can be exported via the gauges’ direct RS232C data output. For more information on the Trimos V Height Gauge click here.